Professor Doctor Abdul Satar Sirat was born in 15. Oct 1937 in the province of Samangan. He is a brother in law to Younis Qanooni. Bachelor's degree in Islamic Studies from Kabul University, completed under-graduate courses in Law at Columbia University, New York, PhD in Islamic Studies from Pacific Western University, California. Sirat is a Professor of Islamic Studies Umm Al-Qura University Makka, Al-Mukarramah, Saudi Arabia since 1975. Abdul Satar Sirat is a very experienced Afghan politician. He was appointed as the Minister of Justice of Afghanistan until King Zahir Shah was deposed in 1973. During the Soviet war, Sirat spent a lot of time teaching abroad. In 1990, then he was sent by Shah to Saudi Arabia and Islamabad, Pakistan for discussions on how to end the Afghan conflict. In 2000, Sirat lived in Jedda, Saudi Arabia and taught Islamic Studies at the King Abdulaziz University. 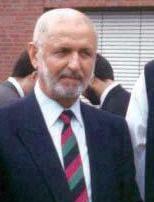 During the Bonn talks in 2001, Sirat was a representative of the Rome Group (former king Mohammad Zahir's supporters). Sirat initially won 11 votes to Karzai's three, to lead an interim government, however, he was asked to step aside in favor of Hamid Karzai because of his ethnicity. Sirat is an Tajik and Karzai is a Pashtun. In October 2004, Sirat ran for president with his Vice presidents Qazi Mohammed Amin Waqad and Abdul Qadir Amini, challenging Hamid Karzai, however, he received less than 1% of the votes. During the Soviet war, Sirat spent a lot of time teaching abroad. Abdul Satar Sirat held various ministerial positions in the early 1970s. Abdul Sattar Sirat lives now in San Diego , CA. USA. Dr Satar Sirat called for the formation of a transitional government to help the country safely pass through its current crisis. Sirat said that the political system in Afghanistan has been built on the basis of discordance and the direct interference of foreign countries since the Bonn Conference in 2001. (20130604) He proposed an interim government be installed if the final results from the April 5 vote are feared causing political differences. Abdul Sattar Sirat told reporters in Kabul the global community had been assisting the Afghan government over the past 13 years but the President Karzai’s administration had failed to effectively utilise the aid. Responding to a volley of questions, he said if the situation after the release of the final results led to a political crisis, “then we need to install an interim government to ameliorate things.” He, however, said if the new government was established in a transparent way, it would help avoid instability.